Adjust trolling speeds to lure action. Find the right water temps. Understanding marine weather before heading out is critical to catching more fish and being safe. FISHBUOY has incorporated marine forecasts to help fishermen determine where to launch, where to run to, and if it just makes sense to just stay home. The combination of mapping your historical fish catches and overlaying marine data will give you a true big picture view. Get FISHBUOY today and start learning how marine conditions impact your fishing. No matter how big your boat, wave heights are a key safety consideration. Please pay attention before you head out. When wave heights do not pose a safety concern, they still impact your level of comfort and the impact your boat haul takes on the run out - and the run back to the dock. FISHBUOY's marine weather map layer helps fishermen determine their ideal angle of departure from the dock, trolling direction, initial setup locations, trolling techniques, lure choice etc. Chart captains on the Great Lakes have learned that following warm surface water movements leads to more hook-ups with monster Walleye. On the other hand, when targetting Steelhead and Rainbow Trout, cold water regimes can produce more fish. Travelling 5-12 miles out can be a costly expense so planning ahead and finding pockets of warm or cold water before heading out will help you catch more fish and save you on gas money. 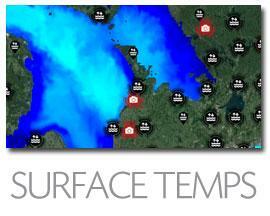 Pay attention to surface water temperatures. 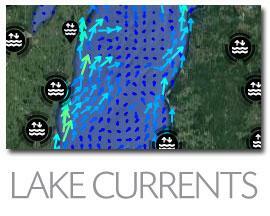 Great Lakes water currents change from day-to-day and hour-to-hour. Currents have a direct influence on migrating bait fish, presence of predatory fish, lure action, and shoreline turbidity. Determining which boat launch to head out from can mean miles of driving. Once in the water, determining the optimal trolling pattern can burn hours until your lures and trolling speed are tuned in. To help fishermen better understand lake currents, FISHBUOY has connected with NOAA to provide you with forecasted water currents data. 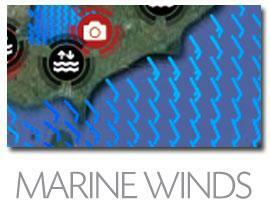 Marine wind barbs have been used by sailor and fishermen as a key tool when planning fishing trips on the Great Lakes. Wind bars help to display the wind direction and wind speed, that directly affect wave directions. As part of the MARINEBUOY feature, fishermen can learn the best location to start out from. Fishing Success Index (FSI) Understanding fish biology and predicting how water and weather conditions influence fish activity can be tricky. That's why we invented the Fishing Success Index (FSI). FSI uses a proprietary algorithm to calculate locations meeting the ideal physical and biological conditions that impact your fishing success. This is no voo doo magic or farmers almanc guessing. FSI uses spatial and temporal modeling techniques to produce a probability of success and displays results on a map.